This diagram outlines the generic problem confronting any dogs when they interact. Any interaction has to be understood as an emotional transaction, and emotion moves from one individual to another by way of the same processes by which physical momentum moves. An animal moves its mind through the same neurological and physical scripts by which it moves its body, in other words, a transfer of emotion goes through the same systems that moderate an exchange of momentum. Because a feeling of movement is the basis of emotion, a transfer of emotion equals a transfer of motion. Thus, an emotional interaction is like two dancers syncopating, or not. That’s its measure of success. So for example if we run into a stone wall, we get hurt because it won’t absorb our momentum. It reflects our momentum back at us. This is ultimately what these dogs can’t do, absorb the other’s emotional momentum (the Drive to make contact), process it and then give it back in a more refined state. The RR is doing more of it at first, but then hits his trigger. At any rate, when a dog sees another dog, or any object-of-resistance, it assesses whether or not it will absorb the force applied to it. (This has been misinterpreted as testing the limits or the capacity of others, but it should more accurately be viewed as a testing of the “self” as in: Will this object of resistance absorb my momentum so that the feedback returned is positive? The dog needs to get feedback from an object-of-resistance in order to feel is “self.”) This is the basic problem confronting our two dogs, and it’s particularly acute because they are both strong natured, they have a strong physical appetite for tactile contact, and thus there is a lot of momentum behind their Drive to make contact. 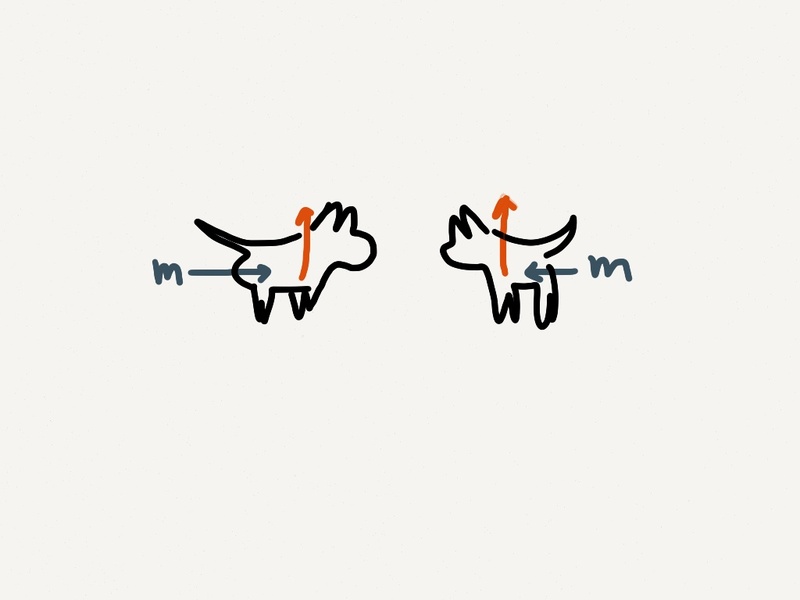 I’ve signified the momentum with a blue M with the arrow pointing toward the other dog, each dog being the object of the other dog’s attraction, i.e the focus of its emotional energy. Their momentum plus the strength of their “upward thrust” (i.e. the drive in the forequarters to maintain equilibrium and signified by the red arrow pointing up) constitutes the overall force of their attraction. The problem however is that there is no clear line of flow, (-) ——> (+) in the moment, no common object-of-attraction or line of travel that they can align and synchronize around and thus combine their emotional energies with a mutual goal. (The purpose of an emotional experience is to align and synchronize with the surroundings.) Even by end of the encounter a mutual line of flow has not yet become apparent, although the beginning of that process is indeed visible with the deflection of the Malinois’ eyes to the side at full height, and the equal/opposite deflection of RR to look down and away. They are becoming more differentiated relative to “The Charge” (i.e. that which triggers DIS). 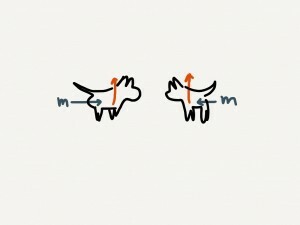 Instead of a mutual line of flow around which they can align and synchronize, they are stuck in what I call the “mirror effect” (^) —> <—- (^) — the RR and Mal both with strong upward thrust and in these same states each dog is predominantly reflecting the other dog’s resistance back to it and the pressure between them is building ever higher even though on the surface we see playing. This begins to suggest why the two dogs go higher and higher over the course of their “play.” Emotion is trying to run to ground but we have (^) meeting (^) rather than (^) meeting (v). All of the above is the logic of emotion as a group system, as opposed to a psychology as these interactions are always presented in Calming Signals or the Dominance Paradigm wherein two dogs are interpreted as two selves relative to each other, both entities as self-contained agencies of intelligence. The emotional logic is completely missing from that kind of analysis. We have to be able to answer the question as to why calming “signals” are calming and why so called dominance disputes resolve without violence without resorting to human thoughts. That is describing, not explaining. Only a group system logic, i.e. an immediate-moment manner of analysis, can accomplish this. An immediate-moment analysis reveals that emotion “wants” to run to ground and along the way it improves the configuration. The encounter ends with both dogs feeling a need to improve their configuration and what is most indicative of their high emotional capacity is that they are manifesting a state of being vulnerable rather than defensive. Vulnerability is the source of arousal, arousal begets sensuality and this is what guides the individual toward a common line of flow.